Climb over untouched hills and experience the wonderful mountain landscape on gentle paths. With snowshoes this is probably the most enjoyable way to discover the most beautiful aspects of winter. 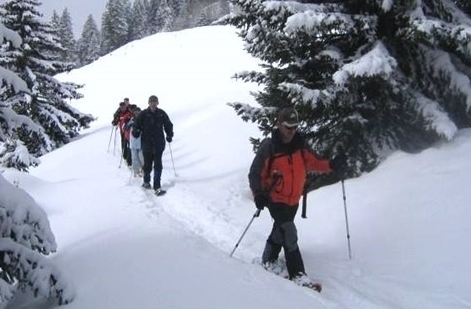 No previous knowledge is required to go snowshoeing- anybody can participate. We recommend stiff and high boots, skiing poles, a small backpack with a drink, athletic and breathable clothing, gloves, sunglasses, and sun screen. The tours take place on Wednesdays or Thursdays. The hiking time is 3-4 hours. In the midst of a snow-covered backdrop you will be served a delicious Grisons speciality for lunch. Price incl. Snowshoe rental: CHF 70.00/p. The hiking time for both ways totals to approx. 2 hours. In our cosy hunting lodge our snow sports instructors Roland and Gerasmus serve you an authentic cheese fondue. Price incl. Snowshoe rental: CHF 60.00/p.